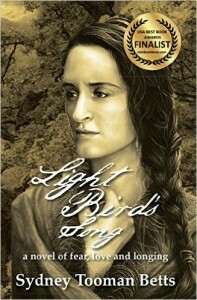 Light Bird’s Song by Sydney Betts is the sequel to A River Too Deep. It is an adventure Native American Christian historical romance and is set in 1839. It can be read as a stand-alone but for maximum enjoyment I recommend reading book one first. Light Bird’s Song was an amazing read, full of godly truths and themes. Sydney Betts does not write ‘preachy’ novels, but writes novels that will speak to your heart and strengthen your faith. The novel has God very much at the heart, as Light Bird says “the Creator is either who He says He is or a vicious enemy. He cannot be both.” Each individual in the novel and the reader too must decide who God is. For Light Bird He is the centre of her life. Her most treasured possession is her Bible, it brings a smile to her face and deep joy to her heart. Oh that we today would treat our Bibles with respect and awe. The Bible is God’s letter to each and every one of us. For a full life, we would be wise to follow His advice. Life for the Christian is not always easy. Light Bird’s mother tells her “walking Jesus’ path does not always free us from hardship.” There are times when Light Bird feels that even God has abandoned her and she wonders where He is. She has been faithful but God seemed silent. She needed her mother to point out God’s faithfulness and responds with “Are you saying He may have used me even though I do not see how?” How easy it is for the reader to empathise with Light Bird’s character, God is always faithful even in His silence. The theme of names is present in the novel. God calls each one of us by our name and we belong to His family. In Light Bird’s Song characters have different names depending on which tribe they are in. Light Bird is the name her parents call her, but her husband calls her Small Doe. The different names emphasise the belonging of a person to a certain group of people. This reminds the reader that we too have different roles – daughter, wife, mum – and God loves us whatever our name. Small Doe has the desire to spread God’s word. Her husband resists at first but in times of crisis, he calls out to I am Christ, who hears him and answers him. Likewise Small Doe’s husband’s grandmother was listening as Small Doe shared God’s word, and she too knew Jesus. This encourages the reader, as we share our faith, who is listening? The theme of forgiveness and grace run throughout the novel. As Preying Eagle prays for his enemies, whose heart could fail to be moved? Small Doe likewise prays for those who have wronged her and she keeps silent rather than run people down or vent her feelings. As Small Doe is faithful to God’s ways, so God is faithful to her. There are many changes in Small Doe’s world within the novel and “there is only one who never changes – Jesus – He alone can satisfy the deep longing in your heart.” This reminds the reader that “God has created us all with an emptiness only He can fill.” So many times we try to plug that hole with stuff that will not last nor satisfy. A major theme of the novel is love – the love of individuals for each other, for community and for God. As the reader hears “the sacrifice of one person’s happiness may purchase survival for the whole clan”, one cannot help but remember the sacrifice of Jesus on the cross for us all. Light Bird’s Song is a fabulous read. As with book one each chapter ends with a portion of scripture and there are passages of scripture throughout. I found it particularly moving when Small Doe sings Mary’s magnificat. Both she and Mary are young and totally trusting in God. I had not read any Native American novels before the two by Sydney Betts but I have thoroughly enjoyed them. Both have excited my soul and I am eagerly awaiting the third and final novel. If like me, you have not read any of Sydney Betts novels, rectify it today – download a copy, grab a coffee and settle back into your favourite chair and transport yourself to nineteenth century America and the home of the Native Americans, and let today’s world go by without you in it for a few hours.